1 Brown bears are large mammals. They have strong bodies covered with thick hair or fur. Brown bears' fur may be blonde, black, brown, or reddish brown. Reddish brown bears are called cinnamon bears. 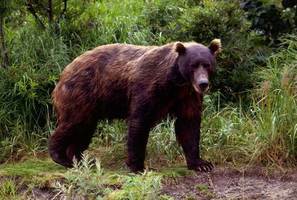 2 Where do brown bears live? Brown bears live in North America, Europe, and Asia. Grizzly bears and Kodiak bears are kinds of brown bears. Bears have short, stubby tails. Their legs are thick and very strong. Their paws are large, too, and each has five long, sharp claws. A bear's head is large with a long muzzle. They have short, rounded ears. 3 Brown bears have a "hump" of muscle on top of their backs over their front legs. This extra muscle helps them run fast. Most of the time, bears walk on all four legs, like a dog. But bears can stand up on their two back legs. When they do, they are almost as tall as a basketball goal!